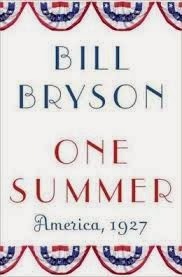 One Summer: America, 1927 by Bill Bryson was an excellent book from the entertaining and funny author of books such as A Walk in The Woods and In a Sunburned Country. The book provided an interesting look at the events of that summer with Bryson including material about Charles Lindbergh, Babe Ruth, President Calvin Coolidge and anarchists. While these subjects and topics were drawn out in specific sections of the book, there was a lot of other ground covered. Some of the additional happenings noted by Bryson included: the extreme weather that summer (with widespread and calamitous flooding of the Mississippi and a Detroit baseball game snowed out in May), Henry Ford and his follow up efforts to the Model T, boxer Jack Dempsey, the growth of radio and move towards sound in motion pictures, the latter stages of prohibition and financial decisions made by world bankers that led to the Great Depression. Back to the people and topics that Bryson included as section headings, Lindbergh as a subject provided absolutely remarkable reading material both with how rickety the Spirit of St. Louis he flew across the Atlantic was and the prolonged and extreme attention he got after his successful flight. In terms of the anarchists, it was interesting how much violence there was in America that summer with multiple bombings occurring and the xenophobia that seemed to help bring out the violence. Tying into something from a few years earlier, prohibition came about in 1919 in part because of anti-German sentiments and covered quite a bit by Bryson was the murder trial and eventual executions of Bert Vanzetti and Nicola Sacco, with the two men both part of the Italian immigrant group often treated horribly in America. There was just so much material in the book and Bryson really presented it well in a conversational manner.